Qatar Airways is set to steal the limelight at this year’s Paris Air Show, taking place from 19 to 25 June at Le Bourget in Paris, with the launch of the first aircraft in its fleet fitted with the revolutionary, award-winning new Qsuite, Qatar Airways’ First in Business Class concept.First retro-fitted in a Qatar Airways Boeing 777 aircraft, Qsuite is a unique and patented seat design that will bring the First Class experience to the airline’s Business Class cabin, setting a new standard for Premium Class travel and redefining industry expectations, in tandem with the airline’s already award-winning Business Class service. The Paris Air Show will be the first time the seat has been displayed in an aircraft, allowing visitors a unique preview of the on-board offering. 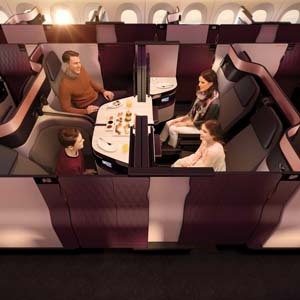 Qatar Airways’ patented new seat design has already gained industry recognition after receiving the Best Airline Innovation of the Year award at the 2017 ULTRAS (Ultimate Luxury Travel Related Awards) for its launch of Qsuite. The prestigious award was presented at a ceremony at The Savoy hotel in London, attended by Sarah, Duchess of York and HRH Princess Eugenie of York, along with industry experts and VIPs. The win was significant in that the award was given before the seat has even commenced service, such is the anticipated impact of the design on the premium travel industry. Qsuite features the aviation industry’s first-ever double bed available in Business Class, with privacy panels that stow away, allowing passengers in adjoining seats to create their own private room. In addition, TV monitors on the centre four seats can move to allow colleagues, friends or families travelling together to transform their space into a private suite for four to work, dine or socialise together. New and patented features within Qsuite provide the ultimate customisable travel experience for Qatar Airways’ Business Class passengers, enabling them to create an environment specific to their own needs. Individually-crafted suites contain luxurious details such as hand-stitched leather and satin rose gold finishing, bringing an additional level of luxury, privacy and style to Qatar Airways’ Business Class offering. To further complement the customisable on-board seating experience that passengers will now enjoy, Qatar Airways is also launching a new food and beverage concept to accompany the current Business Class dine-on-demand service. The delights of this new menu will also be on offer during the air show. The new Business Class menu will now offer an additional selection of snack ‘sharing dishes’ available throughout the flight, allowing travellers to turn dining at 35,000 feet into a social experience. A wake-up Express Breakfast for early morning arrivals will also be available for those who choose to sleep a little longer by making the most of the ‘Do Not Disturb’ option available on the door of their private Qsuite. Known for industry firsts, Qatar Airways is the national carrier of the State of Qatar, and is one of the fastest-growing airlines operating one of the youngest fleets in the world. Qatar Airways has a modern fleet of 200 aircraft flying to key business and leisure destinations across six continents. The airline was awarded the World’s Best Business Class by Skytrax in 2016, and its home hub, Hamad International Airport was also recently honoured with five stars at the Skytrax World Airport Awards.